Snapped these shots earlier today. 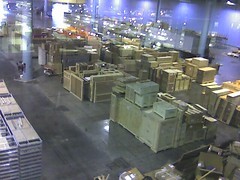 The one on the left is the obvious shot of the booths from above, the one on the right is the neighboring convention center room with all the crates – I’m pretty sure the Lost Ark is in there somewhere. I’m sure everyone is getting the swing of this by now but Artnet Magazine does a brief summary of all the fairs in Miami this week. One of the things I regret not doing last year is taking the tour of the uber Miami art collectors, the Rubell’s, collection. The Rubell Family Collection (95 NW 29 Street, Miami) is one of the leading collections of contemporary art and you can get easy access via a tour for $5 or $2.50 for students and seniors. Open from 9am-5pm; Contact Natasha Lopez De Victoria or 305-573-6090. A definite recommendation. 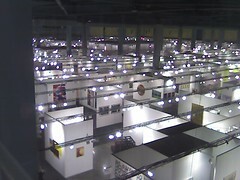 *Art Basel Video Lounge opening from 11am-noon – open until 8pm. *Art Basel Miami Beach Vernissage from 5-8pm. The reason why Sean and I are in Miami is because we are participating in Aqua Art Miami – a first time fair that is featuring about thirty young and established galleries in a crazy hotel. Besides the fact that I think so many of the galleries in Aqua have quality programming, I also think that the people who run them are really quite nice and, when you’re literally living with people, this is a good thing. A lot of people are wondering if all these side fairs (Aqua, NADA, Scope, and Pulse) are just a sign of over-indulgence or if they are, as the New York Times alludes today, fulfilling a huge demand. One thing is for sure, people from all different walks of the art world are waiting to see if they all work and, if not, who survives. Talk to me in a week. On that note, on my blog abLA I am photo-blogging ABMB. Since today was all about installing our room for the Aqua Fair that’s pretty much what my pictures are. I didn’t get any shots of the massive rain pour we had but I know it’s not as much as a novelty as it is to us LA folks. Previews are tomorrow, now is the time for food. Also via Tyler via Barry, Miami Police Take New Tack Against Terror. Police are planning “in-your-face” shows of force in public places, saying the random, high-profile security operations will keep terrorists guessing about where officers might be next. As an example, uniformed and plainclothes officers might surround a bank building unannounced, contact the manager about ways to be vigilant against terrorists and hand out leaflets in three languages to customers and people passing by, said police spokesman Angel Calzadilla. He said there would be no random checks of identification. “People are definitely going to notice it,” Deputy Police Chief Frank Fernandez said Monday. “We want that shock. We want that awe. But at the same time, we don’t want people to feel their rights are being threatened. Shock and awe, eh? Funny you should mention threatening peoples rights. From the ACLU website, a Nov. 17 press release entitled Police Trampled Civil Rights During 2003 Free Trade Protests in Florida, ACLU Charges. Tyler Green just broke the news that both Pulse and NADA are having serious leakage problems. We’ve already heard reports of several inches of standing warter in booths (photos here) and damaged artwork. All this is second/third hand but the photos are pretty convincing. I’m quite releaved to report that things are all safe and dry here at Aqua, ironically I guess. UPDATE: guess I spoke too soon – some of the rooms at Aqua are reporting minor leaking near the air conditioning vents. The rest of us in line need our coffee. We need it now.